Trends are out for all 90 seats. Tally – Congress: 60, BJP: 23, JCC+: 7, Others: 0. Follow The Wire‘s live coverage of the 2018 assembly election results here. New Delhi: Counting of voters for the Chhattisgarh elections began at 8 am. Trends are out for all 90 seats. Congress has a majority. Tally – BJP: 23, Congress: 60, JCC+: 7, Others: 0. In the initial rounds of counting, chief minister Raman Singh is trailing by a good margin in Rajnandgaon. He has held this seat multiple times. The Congress candidate here is Atal Bihari Vajpayee’s niece Karuna Shukla. Manish Kunjam, Communist Party of India candidate and a long-time campaigner against corporate interests in the state, is leading from Konta. T.S. Singh Deo of the Congress party is leading in Ambikapur leaving BJP’s Anurag Singh Dev behind by over 3,000 votes. Ambikapur falls in Surguja district and North region of Chhattisgarh. It is categorised as a rural seat. JCC chief Ajit Jogi leading by more than 10,000 votes in Marwahi. Amarjeet Bhagat of the Congress party is leading with a huge margin of over 21,000 votes in Sitapur seat. The exit polls suggested a close contest between the ruling Bharatiya Janata Party (BJP) and the Congress. 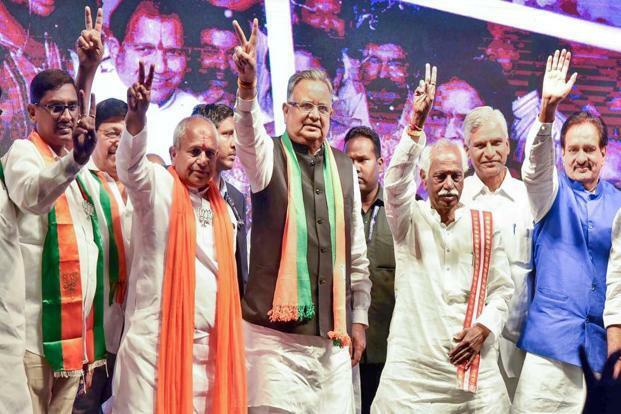 BJP’s Raman Singh is seeking a fourth term as the chief minister, while the Congress is hoping to scupper his chances. A third-front comprising former chief minister Ajit Jogi’s Chhattisgarh Janata Congress (JCC) and the Bahujan Samaj Party (BSP) has not had the impact that it would’ve liked. Chhattisgarh was the only state out of the five that had polling over two phases. On November 12, 18 Naxal-affected constituencies went to the polls. The Naxals had called for a boycott of elections, and several instances of violence were reported. Several security personnel, and a Doordarshan cameraperson, were killed in Naxal-related violence. BJP leader Nandal Mudiyami was injured in an attack. As The Wire had reported, villagers in the region were largely unaware of the contestants and their promises. However, their idea of ‘development’ was different from the government’s. Another report highlighted how caught between state and ultra-left violence, scores of tribal families in the Abujmargh region were forcibly displaced. The second phase of polling in 72 constituencies was held on November 20. The campaign rhetoric was largely cynical, with parties choosing to focus on the faults of their rivals rather than people’s concerns such as “bijli, pani“. While the Congress chose to highlight the alleged Rafale scam, the BJP decried the Congress as a “dynastic” party. Raman Singh is likely to have a huge influence on the outcome of the polls. Despite three consecutive reigns, he is still liked by the people. He is capable of overcoming his administration’s lack of new ideas due to his popularity. This is evident from the fact that even Prime Minister Narendra Modi played second fiddle to Singh in the party’s election posters. In the 2013 elections, though the BJP won ten seats more than the Congress, the vote share was much closer. The BJP garnered 41% of the vote, to Congress’s 40.3%. Therefore, it will be crucial to see if the third-front alliance will eat into the BJP or Congress’s votes. Even if the front does not perform well electorally, it could have a big impact on the outcome.